Two years ago today, my father passed away. He had a heart attack. It was a shock. He was a great dad. He lived on his own. My parents divorced after I graduated from college. I always hated that neither of them found another person to share their lives with. Especially my dad. After he retired, he got comfortable being alone. He was lonely, but at 74 didn't have much need to go trolling the bars for ladies. He didn't understand the Internet, so Match.com was never an option. He said to me one time that he always was kind of a lone wolf and he was okay with that. I took a small amount of comfort in that, but I really had a lot of guilt for not seeing him as often as I should have. I wished he had someone to look after him. I believe he would still be alive today, healthy and happy, if he had found someone. No point in wishing for greener pastures now, I guess. He lived an hour away from my sister and me. He would come for Christmas and Easter. We would meet him for his birthday and Father's Day. We would try to meet him in the winter at Red Lobster or to see a movie. It was hard. I wanted to reach out and invite him over for dinner more, but, as a single parent, he seemed uncomfortable when he was over. It really seemed like he just wanted to go back to comfort of his own world, in his own home. As he got older, he seemed antsy when he was out. So, eventually, I asked him out less and less. I felt as if I was forcing him to be uncomfortable. I know that part of the reason my dad was uncomfortable when he would come over was because I was uncomfortable. I would try to flit around my kitchen and act as if everything was fine and light, but really I was nervous. Nervous that I was forcing him out of his comfort zone. Nervous that I was making him come and be with us. I now suspect that much of that was just in my head. Was he happy to come over? Did he want to be with us more? Or was it hard for him like I thought? I found my answer at the wake after the funeral. One of his long-time friends came up to me and said, "Boy! Your dad talked about your boys so much when he would come visit us". Once a year, my dad would go down to Kentucky and hunt with this friend, and he said he couldn't wait until the boys got old enough to take them fishing. My heart broke when he told me this. Even as I type this two years later, I cry. His friend’s comments were a little window into my dad’s thoughts. He did like to come over and he did enjoy his grandsons. This was confirmation that I wasn't forcing him to be with us. I should have had him with us more. I realize that now and that is still hard to accept. Really, terribly hard. Living with regrets about things you cannot change infects your soul. It can eat you alive if you let it. It can be all consuming. Now, when I see pictures of my dad, all I feel is regret. I try hard to remember great memories, but, truthfully, I just feel sad. Sad that someone I loved so much sat most of his days in his house by himself. Sad that he died in his house alone. Sad because I should have pushed and tried harder. Sad that I didn't. So now, I try harder. I try harder with my mom. I try harder with Michael's 96-year-old grandma. I try harder with Michael's parents. I push them all out of their comfort zone. I invite them out with us more. Even if we are annoying to be with, it has to be better than being alone. I can't change anything about my dad now except to take the boys fishing and hope his spirit comes with us. If your parents are still alive, please try to invite them out with you. Take it from me, you can spend a wonderful life with someone, but after they die all you remember is all of the stuff you should have done with them - even if you and they are uncomfortable at times. On a side note, here is a sweet "heavenly" story. 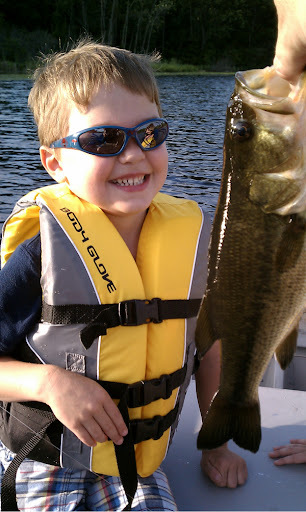 Three months after my dad died, Michael decided to take the boys fishing for their first time on an inland lake! As with any trip, he prepared everything that these two little four year olds would need. It took him all afternoon. He finally left the house at 4pm with two very frustrated and anxious little people. They had been waiting to go fishing since 10am! Michael stopped to get worms on the way. More waiting. Finally, they got to the lake! Michael rented a little fishing boat and set out with two wiggly, excited boys. He had snacks and all of Rocco's diabetic supplies. He had drinks, he had worms, he had life jackets and he had three poles. All set! They all got in the boat and Michael vigorously rowed into the wind for about twenty-five minutes out into the lake. Finally! They were about to have some fun! But, as he started to bait the hooks, Zeke started to cry. Oh for God's sake, whaaaaattt? "Zeke, what's the matter?" Michael asked in a controlled voice. "I haaaavvve to pooooooop!" he wailed! Michael said he almost jumped off the side of the boat, to end his suffering right then and there. He knew he had to go in but he said "Let's just cast one time and then we’ll go home". He had to salvage something from this trip, even if only for himself! He let each boy cast out. Then immediately, he heard the magic words. "DAD! I've got a bite!!!" Michael said he was stunned to see Rocco's line spinning out into the water and the tip of his pole bending straight down! 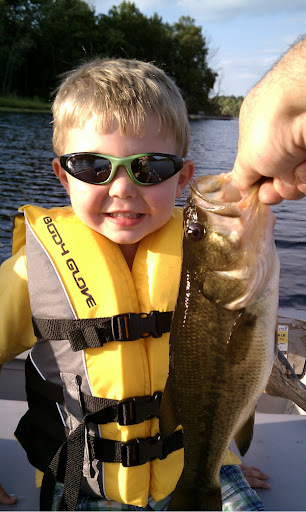 He helped Rocco reel in a huge large-mouth bass! They all took a good look at it. They each touched it, snapped these pictures, and threw it back in the lake. Michael said the boat rental guy was shocked they that they had returned after only an hour on the lake! The funniest part of the story is, they haven't caught a fish since! I guess my dad did finally get to go fishing with the boys and he didn't even have to leave the comforts of heaven to do it! What a beautiful story. 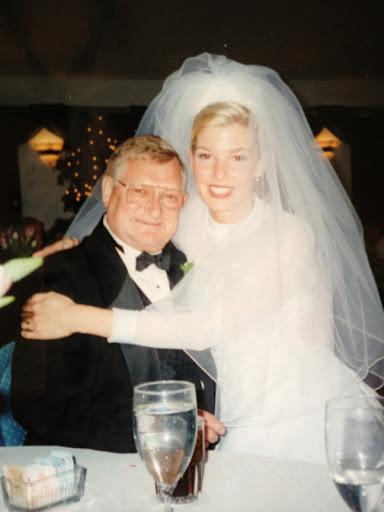 I went 21 years without speaking to my father after my parent's divorce. About seven years ago I changed that. It's been hard, and a great lesson in forgiveness, but I'm so glad I did it. My kids adore him (They had never met him). I only wish my brother and sister -- neither speak to me now that I speak to my dad -- would do the same. The fish -- it gave me CHILLS! So awesome. Thanks for sharing. Awww! Thanks Moira! Comments like yours are the reasons I write. Stay strong on your brother and sister. Sometimes you need to put the mask on your own face before you can help put the mask on theirs! They know your heart and will come back to you one day! I am glad you were able to heal and forgive! That must have been hard.